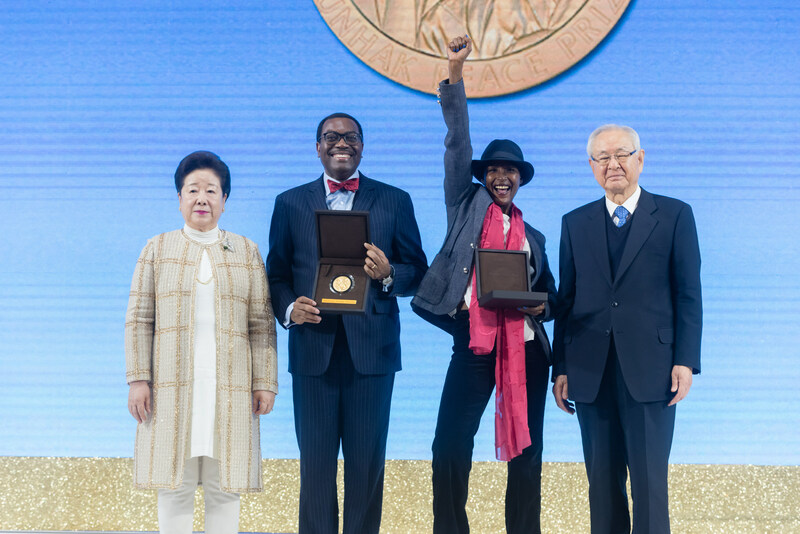 Family Federation for World Peace and Unification (FFWPU) co-founder Dr. Hak Ja Han Moon awarded one million dollars (USD) to this year’s Sunhak Peace Prize laureates, Waris Dirie and Dr. Akinwumi Ayodeji Adesina, as part of her philanthropic work. The biennial award honors individuals and organizations who have made significant contributions to the peace and welfare of future generations. The award ceremony took place on February 9, 2019 at the Lotte Hotel World in Seoul, South Korea. Waris Dirie, human rights activist, was the first person in history to publicize the violence of Female Genital Mutilation (FGM) on the world stage, saving millions of lives by raising the issue of FGM as an international human rights agenda and assisting in passing a UN resolution banning its practice. The Sunhak Committee acknowledges Waris Dirie’sachievements in advocating for the rights of millions of women and girls in Africa. “Thank you for your recognition. Thank you for everything that comes with it, this beautiful peace prize. It’s all I dreamed [of] as a child. All I wanted was peace and to receive this, this is a great gift to me…You giving me a peace prize, it’s because I believe in peace,” stated Ms. Dirie during the press conference. As a victim of FGM herself, having been circumcised at the tender age of five in Somalia, she quit a successful career as a supermodel and dedicated the past 25 years to making FGM a recognized worldwide human rights crisis. She served as UN Special Ambassador for the Elimination of Female Genital Mutilation from 1997 to 2003. She also runs FGM reconstruction surgery centers in Europe. In January 2009, she started the PPR Foundation for Women’s Dignity and Rights, an organization founded along with French business tycoon François-Henri Pinault and his wife, Hollywood actress Salma Hayek. For more information about the Sunhak Peace Prize and this year’s laureates, please visit sunhakpeaceprize.org.